Lots of chopping I know… but lots of satisfaction at the end. I promise. Try a little greek yogurt drizzled on top – it’s delicious! Cut the cucumber, tomato, radish, and pepper into 2/3-inch dice; cut the onion into 1/4-inch dice. Mix everything together in a bowl with the cilantro and parsley. In a jar or sealable container, mix 5 tablespoons of the olive oil, the lemon juice and zest, vinegar, garlic, and sugar and mix well to form a dressing, then season to taste with salt and pepper. Pour the dressing over the salad and toss lightly. (Take care when dressing the salad. I found I only needed about half of the dressing). Mix together the cardamom, allspice, cumin, and 1/4 teaspoon salt and spread on a plate. Toss the cooked chickpeas in the spice mixture in a few batches to coat well. Heat the remaining olive oil in a frying pan over medium heat and lightly fry the chickpeas for 2 to 3 minutes, gently shaking the pan so they cook evenly and don’t stick. Keep warm. 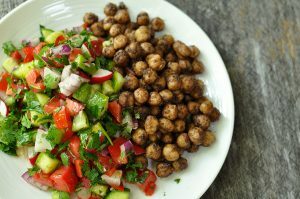 Serve this salad on a plate, in a large circle with the warm spiced chickpeas on top. You can drizzle some Greek yogurt on top to make the salad creamy. The new Yotam Ottolenghi cookbook, Jerusalem, is stunning. I’ve made it through the first few sections and love the history of the recipes and family influence that permeates his meaningful food. On my last visit to his restaurant in London I had an amazing salad with curried yogurt. I can’t even remember what the yogurt was on top of… but I’ve not forgotten the delicious combination. 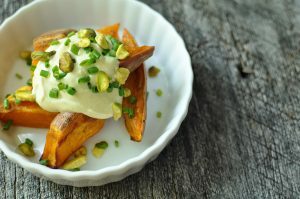 The cold & fragrant yogurt on top of the warm sweet potatoes will not disappoint. Preheat the oven to 400 degrees F. Toss the sweet potatoes and shallots with enough olive oil to coat and put on a baking sheet. Spread out evenly. Bake for 10-15 minutes until golden. When warm, sprinkle with a little salt. Set aside. Mix the yogurt, curry powder and maple syrup all together in a bowl. To serve, place the sweet potatoes on a plate and spoon some of the yogurt in the middle. Top with chives and pistachios. Serve room temperature or slightly warm. This was an accident waiting to happen… the kind of accident that lots of “needy” veg in the fridge & a pool party in need of a snack brings on. It must have been that large bunch of parsley just begging to become chimichurri. Chimichurri wears many hats in my kitchen. 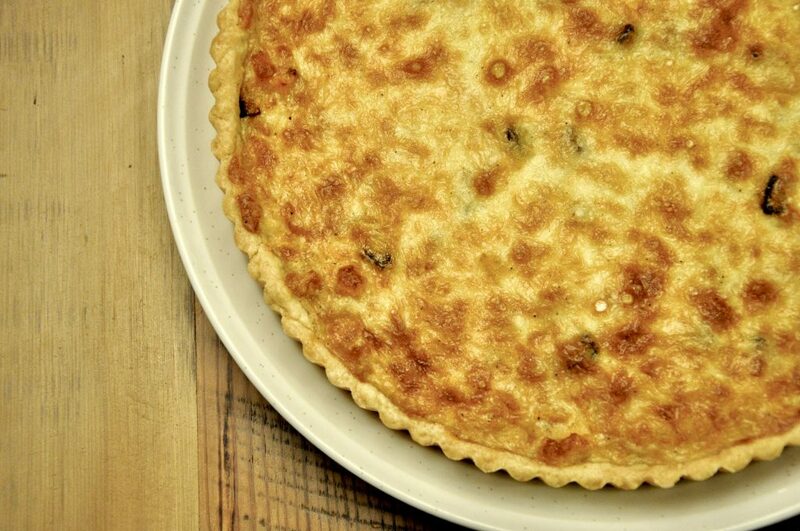 A topper for eggs, a dip for bread, a sauce for lamb & salmon… a spoon full of satisfaction can go a long way. 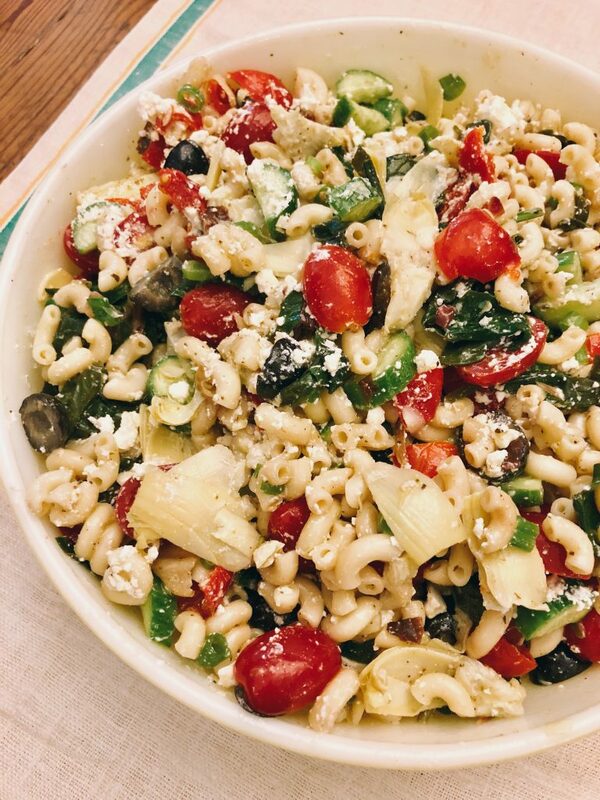 The edge of vinegar, garlic & slight heat of crushed red pepper add a delicious dimension to the sweet vegetables. Use any green vegetable you have on hand. Green beans would be great too. Serve as a side or even better – scoop it up on a chip. To make the chimichurri, add the parsley, fresh oregano, and garlic to a food processor and pulse several times. Add the vinegar, salt, and pepper. Drizzle in the olive oil with the food processor running. Stir in the red pepper flakes. Set aside. Remove the core from the bell peppers and cut into large pieces. Rub the peppers with a little olive oil & bake for 5 minutes at 400 degrees. They should be slightly soft but still have some crunch. When cool, cut into bite size pieces. Set aside. Boil the sugar snap peas for 3 minutes. Remove the peas from the hot water and place in a bowl of cold water to stop cooking. Drain. Set aside. 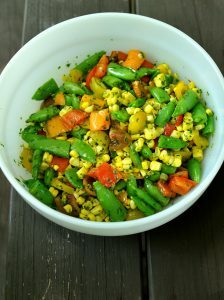 To assemble toss the corn, tomatoes, peas & bell peppers with the chimichurri sauce (you may not need all of it). Adjust seasonings. Serve room temperature. 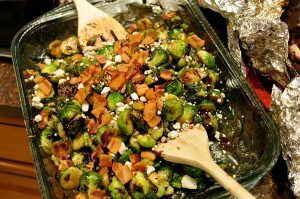 What a great side dish for the holidays. Fast, delicious and so addictive. Use bacon, use pancetta, use a different nut. Drizzle with a little meyer lemon olive oil if you have it on hand. You can’t mess this one up. In a large non-stick pan, sauté bacon or pancetta, stirring frequently, over medium heat, until crisp and lightly golden. Add 1 tablespoon of butter to pan. 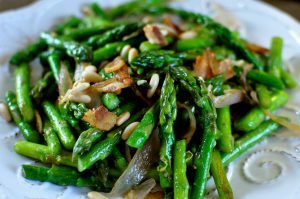 Add asparagus pieces and shallot and sauté until asparagus is tender crisp, about 3-4 minutes. Add garlic, lemon and orange zest and toasted pine nuts and sauté for about 1 minute, until fragrant. Season to taste with freshly ground pepper and salt and serve immediately. 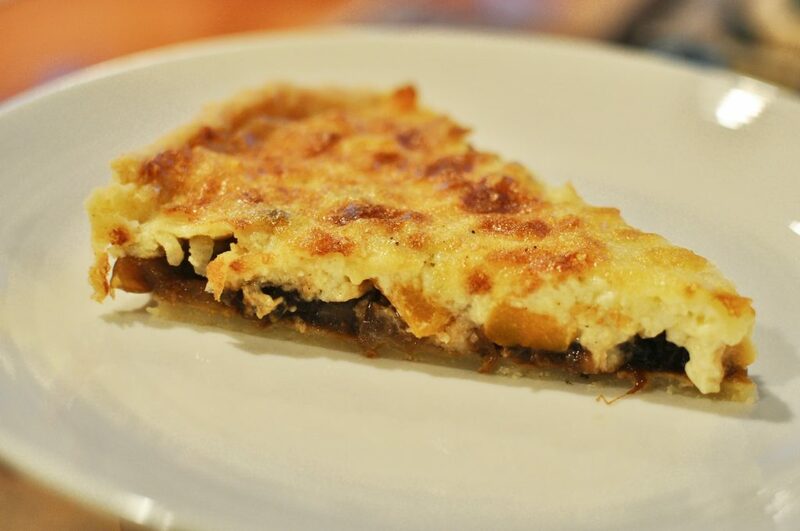 Another Ottolenghi win… simple ingredients and delicious leftover! Separate the broccoli into florets and blanch in boiling water for 2 minutes – don’t be tempted to cook longer! Remove immediately to a bowl of ice water, then drain and leave to dry completely. Once the broccoli is dry, toss with 1/2 cup of the olive oil and a generous amount of salt and pepper. Place a grill pan on high heat and leave for 5 minutes until smoking hot (or grill on your outdoor grill). Grill the broccoli in batches on the hot pan, turning to get lovely char marks on all sides. 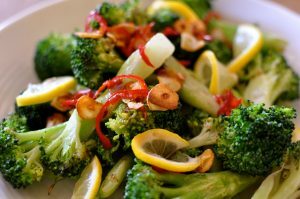 While the broccoli is cooking, place the remaining oil in a small saucepan together with the garlic and chilies and cook on a medium heat until the garlic begins to turn golden brown. Be careful not to let the garlic and chilli burn – they will continue cooking in the hot oil even when off heat. Pour the garlic and chili oil over the hot broccoli and toss well. Season to taste and toss in lemon wedges. Serve immediately or at room temperature. On my most recent trip to London I came across a foodies paradise – Ottolenghi. When I walked in the front door my eye didn’t know where to look first! Beautiful floating layers of salads, whole grains, breads and OH MY desserts had my mouth watering. This cauliflower salad is a perfect example of why Ottoleghi is so successful – he brings bright and satisfying flavors to the simplest of vegetables. I can’t get my nose out of his cookbook so expect lots more from Ottolenghi on The Fifth Tine. 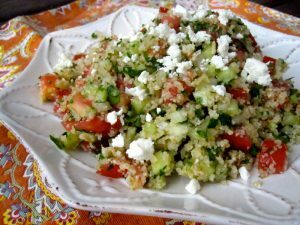 You can make the dressing in a food processor or by hand (we used the processor). Mix together the capers, mustard, garlic, vinegar and some salt and pepper. Whisk vigorously or run the machine while adding half the oil in a slow trickle. You should get a thick, creamy dressing. Taste and adjust seasoning. Add the cauliflower to a large pan of boiling salted water and simmer for just 3 minutes. Drain and run under a cold tap to stop it cooking further. Leave in the colander to dry well, then put it in a mixing bowl with the rest of the olive oil and some seasoning. Toss well. Heat a ridged griddle pan over the highest possible heat and leave it for 5 minutes or until it is really hot. Grill the cauliflower in batches – don’t over-crowd the pan. Keep turning until they are nicely charred all over and transfer to a bowl. 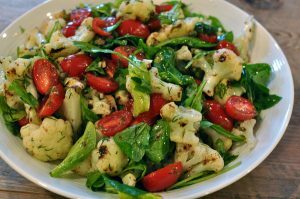 While the cauliflower is still hot, add the dressing, dill, spinach and tomatoes. Stir together, taste and adjust seasoning again.